South Korea’s President Park Geun-hye has condemned the conduct of some of the crew of the Sewol ferry that sank last week, calling it “akin to murder”. 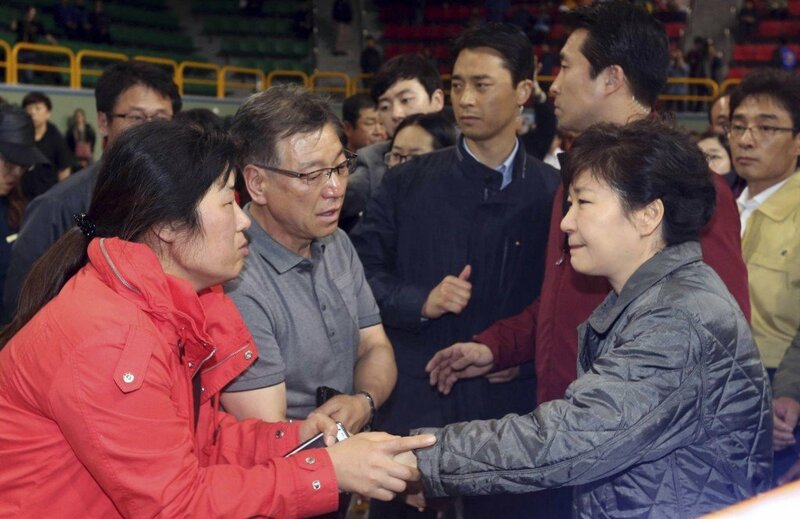 Park Geun-hye said that those to blame would have to take “criminal and civil” responsibility for their actions. Divers are continuing to recover bodies from the ferry, as they gain access to more of the submerged hull. The death toll now stands at 64, with 238 people still missing, most of them students from a school near Seoul. Bodies are being brought two or three at a time back to Jindo, a southern island close to where the ferry sank. Police, meanwhile, have been given access to hundreds of messages sent by passengers and crew so they can construct a detailed chronology of the ferry’s last hour. Park Geun-hye, whose government has faced criticism over its initial response to the disaster, told aides that the actions of the captain and some of the crew “were utterly incomprehensible, unacceptable and tantamount to murder”, the presidential office said. A total of 174 passengers were rescued from the Sewol, which capsized as it sailed from Incheon in the north-west to the southern island of Jeju. But there were 476 people on board – including 339 children and teachers on a school trip. Many were trapped inside the ship as it listed to one side and then sank. Investigations are focusing on whether the vessel took too sharp a turn – perhaps destabilizing the vessel – before it started listing and whether an earlier evacuation order could have saved lives. Details of the panic and indecision on the bridge emerged on Sunday, when the coastguard released a transcript of the last communications between the crew and controllers. In the transcript, a crew member repeatedly asks if vessels are on hand to rescue passengers if evacuation is ordered. Sewol captain, Lee Joon-seok, has said he delayed the move for fear people would drift away. Lee Joon-seok, 69, was not on the bridge when the ferry began listing. It was steered by a third mate who had never navigated the waters where the accident occurred, prosecutors said on Saturday. Sewol captain and two other crew members have been charged with negligence of duty and violation of maritime law. Four more crew members were reported to have been detained on Monday over allegations they failed to protect passengers. It has since emerged that Lee Joon-seok appeared in a promotional video for the journey four years ago describing the ferry journey as safe as long as the passengers followed the crew’s instructions. Over the weekend, there were angry confrontations between relatives of those on board and police, after a group began a protest march. The relatives say they want more information both about what happened and about how soon the remains of their loved ones can be recovered.